New Delhi sources stated that Reliance Jio on Friday announced a New Year offer under which it offers 100% cash back on a recharge of Rs 399 in the form of coupons that can be availed on e-commerce portal AJIO. Jio said in a statement "Jio in partnership with AJIO has introduced its Jio Happy New Year Offer. The offer provides 100% cash back in form of AJIO coupon. 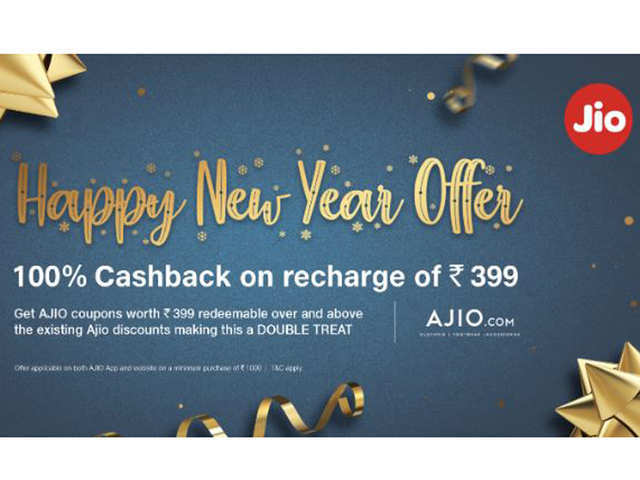 Customers performing recharge of Rs 399 will get 100% cash back in form of AJIO coupon. AIO coupon worth Rs 399 will be credited in 'MyCoupons' section of MyJio". Reportedly the coupon credited can be redeemed on AJIO app and website on a minimum cart value of Rs 1,000. The statement said "AJIO coupon worth Rs 399 can be redeemed over and above the existing AJIO discounts”. Accordingly the offer is applicable for both existing and new Jio users for recharges done between December 28, 2018, to January 31, 2019. Moreover the coupons received during this period can be redeemed on or before March 15, 2019. Reports added Reliance Jio has been coming up with New Year offers since the commencement of its business in 2016, under the scheme, it has been offering services at effectively free rates.